Currently I am attending St. Cloud State University, where I am majoring in Elementary Education and minoring in Human Relations. I am a member and captain of the softball team at St. Cloud State. This fall, I will be entering my senior year at St. Cloud State. 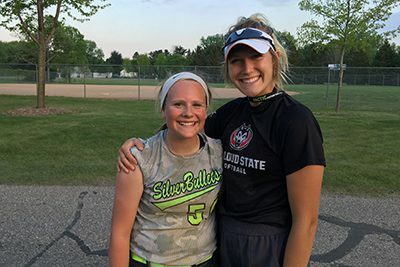 Over the summer, I am coaching the 12U Silver Bullets softball team, and ironically, MPA student, Siri S. is one of my players. Being a college athlete and networking with coaches and professors has inspired me to open up new doors and has helped me figure out a career path that fits me. Throughout my experiences both at MPA and now at St. Cloud State, I can say that all of the coaches who helped me get to where I am today have been my biggest inspirations. Every coach, teacher, or professor I have ever had has given me the tools I need to be successful in not only my career, but in life as well. MPA opened me up to experiences I never would have received anywhere else. I had such great interactions with my teachers because of the dedication they put fourth toward student success. MPA prepared me for the heavy parts of college as well as how to balance being a student and an athlete. What’s next? Any aspirations-personal or professional-that you’d like to share? After I complete my bachelor’s degree, I will be looking into a school to complete my master’s in administration as well as become a graduate assistant coach for the university’s softball team.